At this year's Malaysia International Golf Symposium, I spoke about grasses, how they perform, and their nutrient requirements. This presentation handout contains additional information and links that supplement the material presented at the symposium. Click here to download the presentation slides on Nutrient Requirements for Golf Courses in Asia. Click here to download the presentation slides on Selection of Grass. On October 21 to 23, the Malaysia International Golf Symposium 2013 will be held at The Royal Selangor Golf Club and at The Royale Chulan Hotel in Kuala Lumpur. Registration is now available through the Malaysian Golf Association. I will be speaking about Nutrient Requirements for Golf Courses in Asia and then giving another presentation on Selection of Grass. Both of these topics are ones I am excited to speak about and are ones that I have studied extensively over the past few years. The program includes other presentations about turfgrass management, including one on the Latest Trends in Golf Course Maintenance by Andy Johnston, along with additional talks on a range of subjects related to course design, construction, and club management. I made the bubble plot above to see how the differences in temperature and sunlight and rainfall between cities would appear if plotted this way. The data are from climatological normals provided by national meteorological services and the World Meteorological Organization, collected in some cases from the climate section of a city's page on Wikipedia. I made this plot for a few reasons. I saw a job posting for a superintendent position in Asia saying that experience working in a Florida-type climate would be desired, and I wanted to plot a few cities this way to see how cities in Asia compared with Florida. Someone also asked me if I thought it was more difficult to manage warm-season grasses in Singapore or in Florida, and I thought that a plot such as this might make my answer more clear. And I also notice as I travel that a grass that grows so well in Honolulu, for example, may not grow well at all in Bangkok. There are clear differences in suitability of grasses for different growing environments. And as I work with some new software, I saw a tutorial to make this type of bubble plot on the FlowingData website and I wanted to try it for myself. 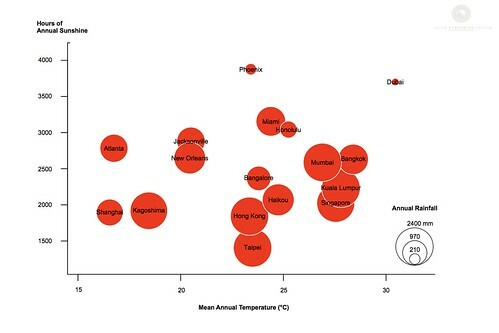 When plotted this way with mean annual temperature on one axis and hours of sunshine on another axis (the area of the circle for each city is proportional to annual rainfall), one can see that the cities in Asia tend to have a higher annual temperature, have less annual sunshine than the cities plotted from the USA, and have substantially more precipitation. A quick look at the bubble plot shows that Singapore, for example, has about 60% the sunshine of Miami while receiving almost twice the rainfall. This doesn't tell the whole story about which grasses perform best in a certain area. We can also consider the winter temperatures, the summer temperatures, the timing of rainfall and dry seasons, etc., but simply plotting by temperature and sunshine tells us a lot. Turfgrass managers in Southeast Asia know that zoysiagrass (Zoysia matrella) and broadleaf carpetgrass (Axonopus compressus) thrive in this climate while bermudagrass maintained as a turfgrass struggles. This type of plot helps us to understand why. At the Marukatayawan Palace in Thailand, we see that zoysia grows in the sun and broadleaf carpetgrass covers the shaded areas under the trees. These native grasses thrive when maintained as turfgrass in this region, while grasses such as bermudagrass which have a higher light requirement cannot compete with zoysia even in full sun. Why is that? Because even in full sun, there is still relatively little sunshine in Southeast Asia compared with Florida. Turfgrass pathologist Dr. Lane Tredway from North Carolina State University recently made a visit to Southeast Asia for the purpose of collecting dollar spot samples. From ATC's Thailand base, we went to Vietnam, Malaysia, and the Philippines to collect dollar spot from many different grass types: bermudagrass, zoysia, seashore paspalum, carpetgrass, creeping bentgrass — even from some sedges. There is not much creeping bentgrass in Southeast Asia but we traveled to high elevations to find it at Dalat in Vietnam, at the spectacular Mount Kinabalu Golf Club in Sabah (below), and at Camp John Hay in Baguio. Dr. Tredway has chronicled this trip in a post entitled Dollar Spot Expedition to Southeast Asia on the Turf Diseases website. Dollar spot is ubiquitous and is especially so on seashore paspalum turf. This project looks at the different strains of dollar spot as they are found on different grass types and in different geographical and climatic areas. The idea is that a better understanding of the dollar spot pathogen itself will allow for the development of better control measures for this disease in the future. One of the papers I found most interesting last year was Characterizing Weed Populations in Different Turfgrass Sites throughout the Klang Valley of Western Peninsular Malaysia (Uddin et al., 2010). Weeds are one of the biggest challenges facing turfgrass managers in tropical Asia. Uddin's survey of 53 sites in the Klang Valley included seventeen athletic fields, six sod farms, nineteen residential lawns, and eleven golf courses. In total, 79 different weed species were identified in this survey, with 63 of the species being found in lawns, 29 on athletic fields, 25 on sod farms, and 23 on golf courses. Some of the most pervasive weeds were the sedges Cyperus aromaticus and Cyperus compressus along with grasses Chrysopogon aciculatus, Eleusine indica, and Digitaria fuscescens. In three bermudagrass fields, 37 weed species were found. In three manilagrass (Zoysia matrella) fields, there were less than half as many species present. Only seventeen weed species were found in the manilagrass fields compared with 37 in the bermudagrass fields. Wiecko (2000) wrote about the challenges of growing bermudagrass in tropical Asia and this survey confirms quantitatively what turfgrass managers in Asia see every day: bermudagrass is easily infested with weeds, while manilagrass produces a dense sward that has comparatively few weeds. I've just returned to Bangkok after the Sustainable Turfgrass Management seminar held at Saujana Resort on October 26 & 27. This event was supported by The R&A and was presented by Saujana in partnership with The R&A, the Malaysian Golf Association, Golf Course Superintendents Association of Malaysia, Asian Golf Industry Federation (AGIF), and ATC. John Geary, Environmental Agronomist from the Australian Golf Course Superintendents Association, spoke about water management plans, preparing for drought and managing turfgrass through drought conditions, and on irrigation water quality and grass variety trials conducted at Australia. Kenne James (from Toro) and David Patterson (from RainBird) gave a presentation on optimized irrigation of golf course turf on behalf of AGIF and during the field seminar demonstrated the procedure for measuring the distribution uniformity (DU) during an irrigation audit. I found this session especially helpful. Understanding how much water is applied and where it is applied and how one's irrigation system is operating in the field is critical to the maintenance of high-quality playing surfaces. James and Patterson provided a number of helpful tips to ensure that an irrigation system will operate at its optimal level of efficiency. Geary and I spoke during the practical session about optimizing the rooting system of turfgrass, techniques on organic matter control for putting green turf, and the importance of organic matter management in general, and on problem-solving techniques, drainage, and a host of other topics as we had a look round the newly-renovated Bunga Raya course at Saujana. During the classroom session, I gave seminars on grass selection for golf courses in SE Asia, irrigation water quality, and golf course renovation with more discussion of grass choices. It was an excellent program at a superb venue with an engaged and inquisitive audience.